If you can speak … you can sing … Effortlessly! 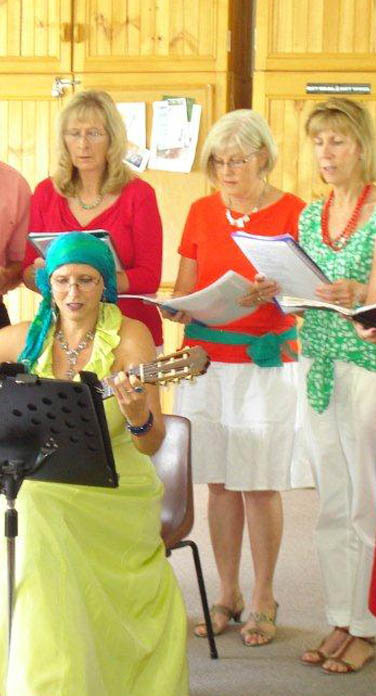 Wendy offers private vocal lessons, ‘Singing from the Heart’ Workshops, Choir, songwriting, music theory and guitar. Everyone is welcome! Wendy teaches all ages and abilities. Are you a shower singer? Have you always dreamed of singing? Have you been told in the past that you can’t sing? Do you perform already and just need some specific help with a vocal challenge? Would you like to sing in a group who have become friends? Wendy helps you to realize your dreams. She is devoted to nuturing people and their voices, encouraging you to find your unique voice. Classes are calming, envigorating, safe, supportive and fun. You need the desire to sing and your favourite song. We cover breath management, postural alignment, safe vocal techniques, strengthening and flexibility exercises, vocal qualities, colour, range, tone, articulation, phrasing, expression, positive mind, strong body, confidence, performance skills, microphone technique and performance anxiety.